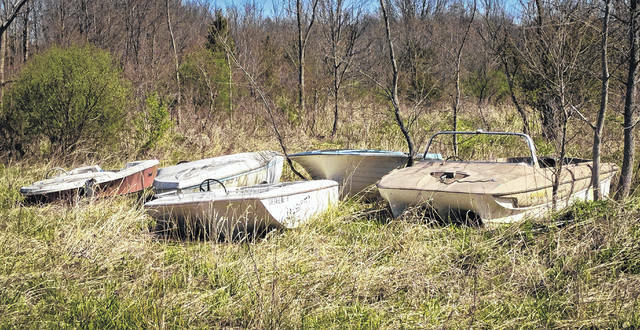 Further back on the property of the old junkyard in Berlin Township sits some abandoned speedboats. According to Michael Shade, attorney for Savko Brothers Properties, even though the referendum failed Tuesday to rezone the property to Planned Industrial, Savko is committed to keeping his promise of cleaning up the property. Voters in Berlin Township swiftly defeated a referendum Tuesday, overturning a rezoning measure approved by trustees that went against the wishes of many residents. The referendum received 32.77 percent of the vote in the affirmative, with 67.23 percent voting against the referendum, causing the rezoning of the 24 acres of property owned by Savko Brothers Properties X LLC located at 5427 State Route 37 E., Delaware, to fail. Trustees had approved rezoning the property to Planned Industrial from Farm Residential back on Oct. 9, 2017. At the time, Savko proposed building Savko Commerce Park on the property, which included plans for the construction of a concrete batching plant. Township residents opposed the plant, citing that the added traffic of the 80,000-pound cement trucks would only add to the already congested highway problem, and the possibility of cement dust in the air being harmful. According to Savko, the plan was to have a state-of-the-art facility that is self-contained that would not allow particulates to escape to the outside. Graeme Quinn, the Berlin Township resident who led the opposition against the rezoning, said he would probably get some sleep, finally. Quinn said the effort was a grassroots movement that worked with an out-of-the-pocket budget. Quinn added it was amazing to see amounts in the budget for $5.98 to print flyers, completely opposite of a big corporate budget, or the sight of people sticking stamps on envelopes with no automation. He said it showed the resolve of the community to defeat the rezoning. Attorney Michael Shade said he had not talked to his client, Marty Savko, of Savko Brothers Properties, about building the concrete plant on the corner property Savko owns next door to the site where the plant was to be built prior to voters overturn the rezoning amendment, but assumed the plan would go forward. Savko purchased the property recently as the backup site for the plant if the referendum was defeated. Shade said it will take time and that Savko plans to work with Evolution Ag, the tractor company that leases the property, to satisfy the company’s needs and Savko’s needs. He said Evolution Ag has a good business there and helps the community. However, Shade said by the time Savko works through the process, it would be late spring 2019 before construction would start. In a recent report, Berlin Township Fire Department officials said the biggest problem with the U.S. Route 36/state Route 37 corridor is insufficient water pressure from the hydrants. Shade said in the same report that until the tower is built, Savko will have an interior tank of 10,000 gallons with exterior hookups that the fire department could use in case of an emergency. Shade said he didn’t know what Savko would do with the property since the referendum was defeated. This entry was tagged Berlin Township, D. Anthony Botkin, Evolution Ag, Quinn, Referendum, Savko, Shade. Bookmark the permalink.